Below is Elixir by Flux. This is an ITU-R BS.1770/EBU R128 compliant multichannel True Peak Limiter. It’s just one of the tools available that can be used in the workflow described below. In this post I also mention the ISL True Peak Limiter by Nugen Audio. In my previous post I made reference to an audio processing workflow recommended by Thomas Lund. The purpose of this workflow is to effectively process audio files targeting loudness specifications that are suitable for internet and mobile distribution. in other words – Podcasts. 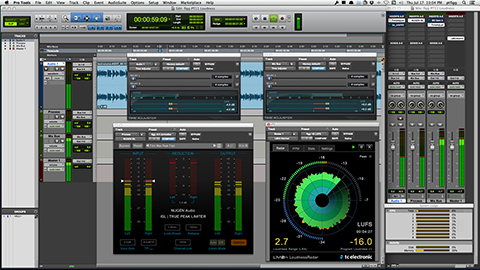 My first exposure to this workflow was reading “Managing Audio Loudness Across Multiple Platforms” written by Mr. Lund and included in the January 2013 edition of Broadcast Engineering Magazine. “Mobile and computer devices have a different gain structure and make use of different codecs than domestic AV devices such as television. Tests have been performed to determine the standard operating level on Apple devices. Based on 1250 music tracks and 210 broadcast programs, the Apple normalization number comes out as -16.2 LKFS (Loudness, K-weighted, relative to Full Scale) on a BS.1770-3 scale. Step 1 – Normalize to target level -24.0 LUFS. (Notice Mr. Lund refers to LKFS instead of LUFS. No worries. Both are the same. LKFS translates to Loudness Units K-Weighted relative to Full Scale). So how do we accomplish this? Simple – the source file needs to be measured and the existing Program Loudness needs to be established. Once you have this descriptor, it’s simple math. You calculate the difference between the existing Program Loudness and -24.0. The result will give you the initial gain offset that you need to apply. I’ll point to a few off-line measurement utilities at the end of this post. Of course you can also measure in real time (on-line). In this case you would need to measure the source in it’s entirety in order to arrive upon an accurate Program Loudness measurement. Keep in mind since random Program Loudness descriptors at the source will vary on a file to file basis, the necessary gain offset to normalize will always be different. In essence this particular step is variable. Conversely steps 2 and 3 in the workflow are static processes. They will never change. The Limiter Ceiling will always be -9.0 dBTP, and the final gain stage will always be + 8dB. The -16.0 LUFS target “math” will only work if the Program Loudness is -24.0 LUFS at the very beginning from file to file. Think about it – with the Limiter and final gain stage never changing, – if you have two source files where file A checks in at -19.0 LUFS and File B checks in at -21.0 LUFS, the processed outputs will not be the same. On the other hand if you always begin with a measured Program Loudness of -24.0 LUFS, you will be good to go. [– If your source file checks in at -20.0 LUFS … with -24.0 as the target, the gain offset would be -4.0 dB. [– If your source file checks in at -15.6 LUFS … with -24.0 as the target, the gain offset would be -8.4 dB. [– If your source file checks in at -26.0 LUFS … with -24.0 as the target, the gain offset would be +2.0 dB. In order to maintain accuracy, make sure you use the float values in the calculation. Also – it’s important to properly optimize the source file (see example below) before performing Step 1. I’m referring to dynamics processing, equalization, noise reduction, etc. These options are for the most part subjective. For example if you prefer less compression resulting in wider dynamics, that’s fine. Handle it accordingly. Step 2 – Pass the processed audio through a True Peak Limiter with it’s Peak Ceiling set to -9.0 dBTP. Typically I set the Channel or “Stereo” Link to 100%, limiting Look Ahead to 1.5ms and Release Time to 150ms. Step 3 – Apply +8dB of gain. I’m using the gain adjustment feature in two instances of the Avid Time Adjuster plugin for the initial and final gain offsets. The source file on the track was first measured for Program Loudness. The necessary offset to meet the initial -24.0 LUFS target was -4 dB. The audio then passes through the Nugen ISL True Peak Limiter with it’s Peak Ceiling set to -9.0 dBTP. Finally the audio is routed through the second instance of the Adjuster plugin adding +8 dB of gain. The Loudness meter displays the Program Loudness after 5 minutes of playback and will accurately display variations in Program Loudness throughout. Bouncing this session will output to the Normalized targets. Note that you can also apply the initial gain offset, the limiting, and the final gain offset as independent off-line processes. The preliminary measurement of the audio file and gain offset are still required. Next I apply additional processing options that I feel are necessary to create a suitable intermediate. I reiterate these processing options are entirely subjective. Your desire may be to retain the Loudness Range and/or dynamic attributes present in the original file. If so you will need to process the audio accordingly. The Program Loudness for this intermediate file is -20.2 LUFS. The initial gain offset required would be -3.8 dB before proceeding. After applying the initial gain offset, pass the audio through the limiter, and then apply the final gain stage. That’s about it. We’re at -16.0 LUFS with a suitable True Peak Max. I’ve experimented with this workflow countless times and I’ve found the results to be perfectly acceptable. As I previously stated – preparation of your source or intermediate file prior to implementing this three step process is subjective and totally up to you. The key is your output will always be in spec..
[– The new Loudness Meters by TC Electronic support off-line measurements of selected audio clips in Pro Tools (Audio Suite). [– Auphonic Leveler Batch Processor. I don’t want to discount the availability and effectiveness of the products and services offered by Auphonic. It’s a highly recommended web service and the standalone application that includes high quality audio processing algorithms including Loudness Normalization. [– Using FFmpeg from the command line. [– Using r128x from the command line. Note there is a Mac only front end (GUI) version of r128x available as well. In my No Free Pass for Podcasts post I talked about why the Broadcast Loudness specs. are not necessarily suitable for Podcasts. I noted that the Program Loudness targets for EBU R128 and ATSC A/85 are simply too low for internet and mobile audio distribution. Add excessively dynamic audio to the mix and it will complicate matters further, especially when listeners use mobile devices to consume their media in less than ideal ambient spaces. Earlier today I was discussing this issue with someone who is well versed in all aspects audio production and loudness processing. He noted that ” … the consensus of it all is, that it is a bad idea to take a really nice standard that leaves plenty of headroom and then start creating new standards with different reference values.” The fix would be to “keep production and storage at -23.0 LUFS and then adjust levels in distribution.” Valid points indeed. However in the real world this mindset is unrealistic, especially in the internet/mobile/Podcasting space. The fact of the matter is there is no way to avoid the necessity to revise the standards that simply do not work on a platform that consists of unique variables. And so considering these variables, the implementation of thoughtful, revised, best practices that include platform specific targets for Program Loudness, Loudness Range, and True Peak are unavoidable. Independent Podcasters and network driven Podcasts using arbitrary production techniques and delivery methods simply need direction and guidance in order to comply. In the end it’s all about presenting well produced media to the listener. Recently I came across a tweet where someone stated “I love the show but it is consistently too quiet to listen to on my phone.” They were referring to the NPR program Fresh Air. I’m not exactly sure if this person was referring to the radio broadcast stream or the distributed Podcast. Either way it’s an interesting assertion that I can directly relate to. I subscribe to the Fresh Air Podcast. This will probably not surprise you – I refuse to listen to the Podcast right out of the box. When a new show pops up in Instacast, I download the file, decode to WAV, convert to stereo, and then reprocess the audio. 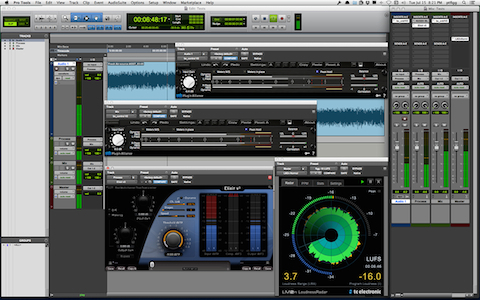 I tweak the dynamic range and address show participant audio level variations using various plugins. I then bump things up to -16.0 LUFS (using what I like to refer to as “The Lund Method”) while supplying enough headroom to comply with -1.0 dBTP as my ultimate ceiling. I’ll get into the specifics in a future post. “Mobile and computer devices have a different gain structure and make use of different codecs than domestic AV devices such as television. Tests have been performed to determine the standard operating level on Apple devices. Based on 1250 music tracks and 210 broadcast programs, the Apple normalization number comes out as -16.2LKFS (Loudness, K-weighted, relative to Full Scale) on a BS.1770-3 scale. In this snapshot I demonstrate the described workflow. I’m using two independent instances of the bx_control plugin to apply the gain offsets at various stages of the signal flow. 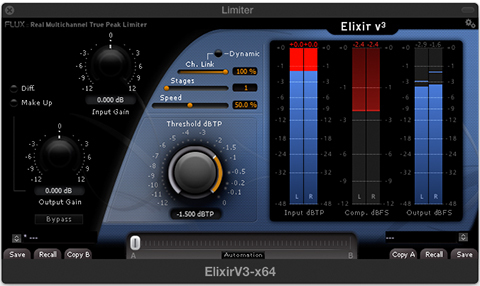 After the initial calculated offset is applied, the audio is routed through the Elixr True Peak Limiter and then out through the second instance of bx_control applying +8dB of static gain. You can also replicate this workflow on an off-line basis. Note that I’ve slightly altered the limiting recommendation. So why do I feel the need to do this? The difference between the published source audio and the reprocessed version is quite obvious. The Loudness Normalized audio is so much more intelligible and easier to listen to. In my view the published audio is simply out of spec. and unsuitable for a Podcast. Bear in mind the condition of the source audio is not uncommon. The problems that persist are not exclusive to podcasts distributed by NPR or by any of their affiliates. Networks with global reach need to recognize their Podcast distribution platforms as important mechanisms to expand their mass appeal. It has been noted that the Public Radio community in general is exploring ways to enhance the way in which they produce their programs with focus on loudness standardization. My hope hope is this carries over to their Podcast platforms as well. For more information please refer to “Managing Audio Loudness Across Multiple Platforms” by Thomas Lund at TVTechnology.com.